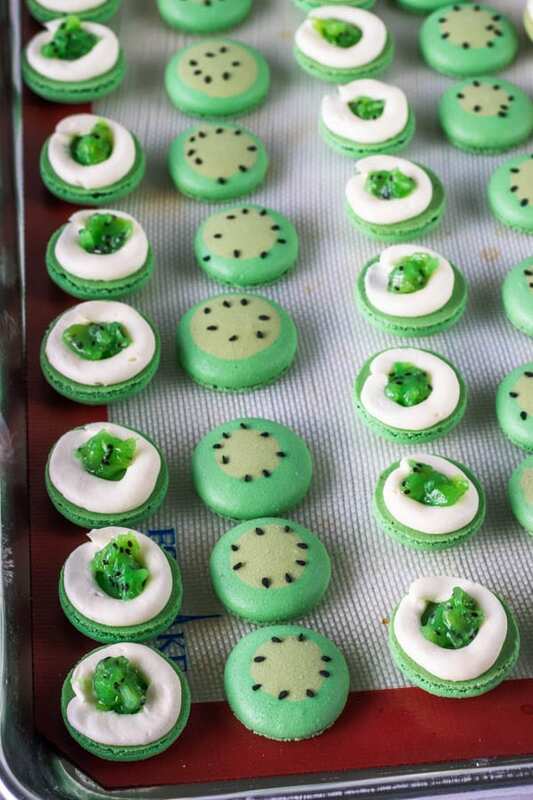 Presenting to you today, Kiwi Macarons! Filled with kiwi jam! Have you ever had kiwi jam before? 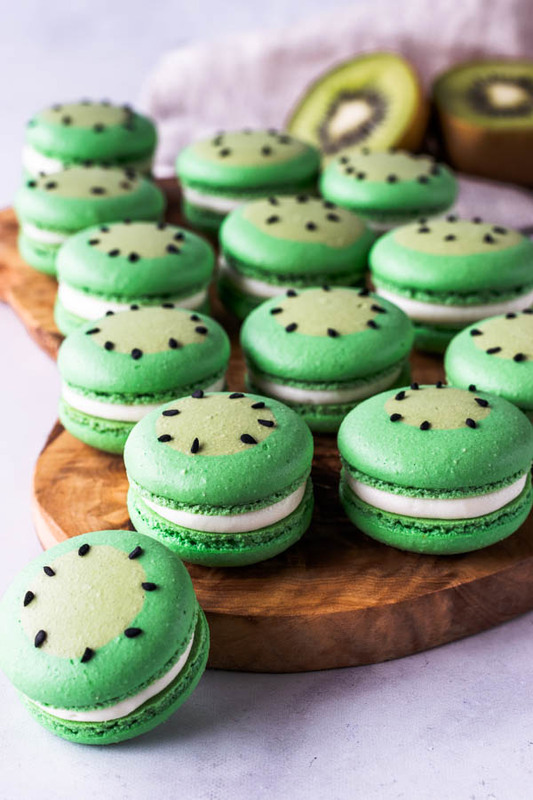 Neither have I before I made these Kiwi Macarons. I made the kiwi jam just like I usually make any other jam, a little bit of sugar (or maple syrup), some cornstarch and that’s it. Very simple, very delicious! 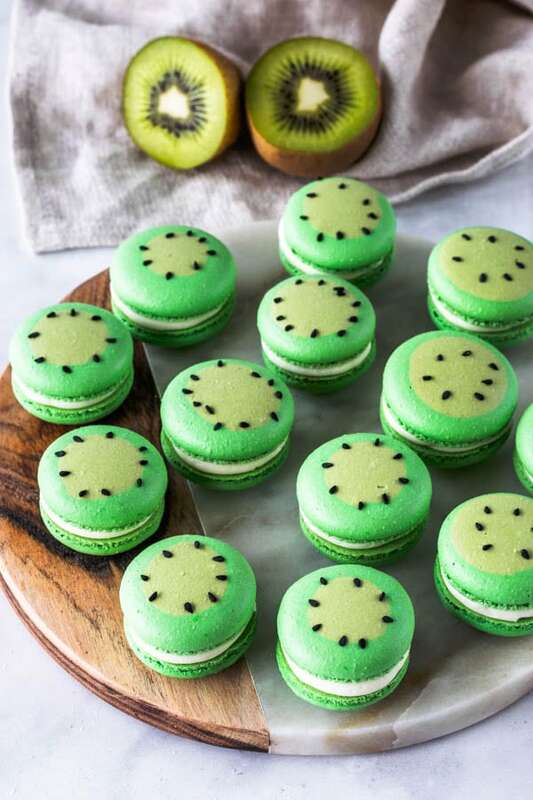 Making these Kiwi macarons was super fun. I made them specially for a collaboration with the Jumprope app. Check out my Jumprope tutorial!! I had a lot of fun doing this! 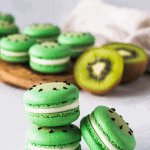 How to Make Kiwi Macarons by piesandtacosblog on Jumprope. To make these Kiwi Macarons, basically I separated the macaron batter into two separate bowls, about 3/4 of the batter in one bowl, and 1/4 in another bowl. 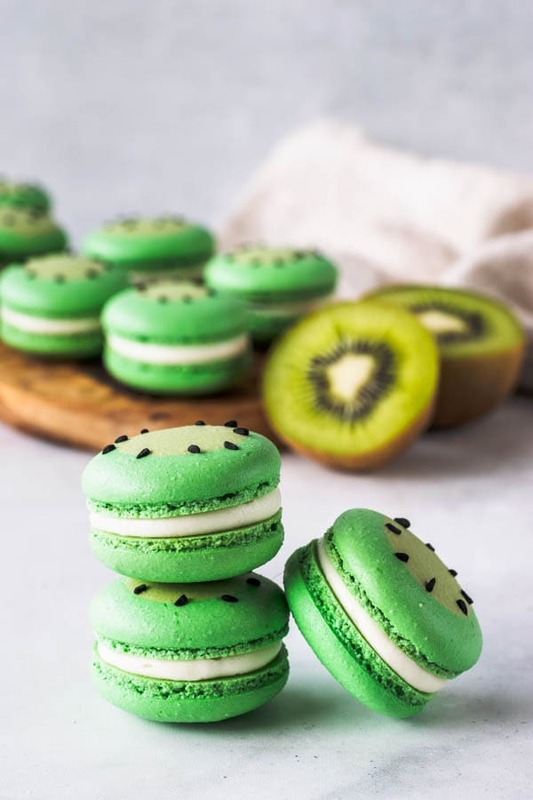 I colored the 3/4 of the batter with green food coloring, and the 1/4 of the batter with less food coloring to make a lighter color, in order to make the middle of the kiwi macarons. Then I topped the shells with some black sesame seeds, to replicate the kiwi seeds. 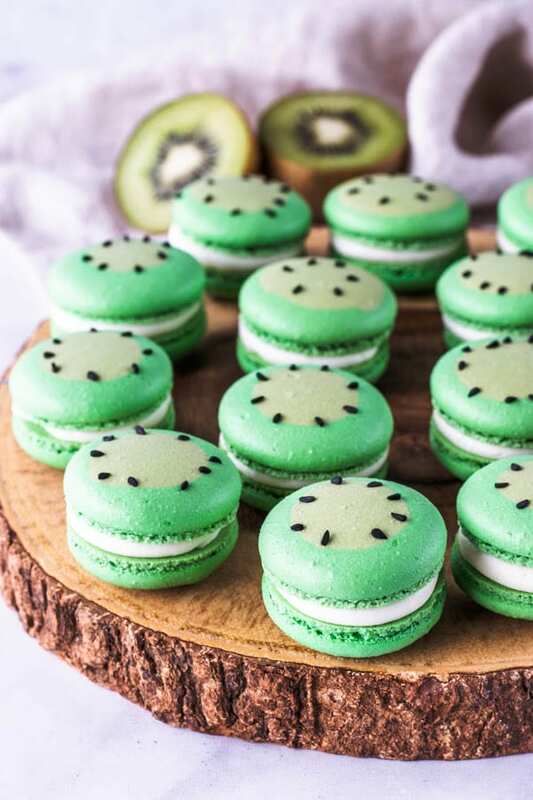 Please read down below some tips on how to make these Kiwi Macarons, and also watch my Jumprope tutorial, so you can see in detail how I make my macarons in general and how I piped these kiwi macaron shells. When you divide the batters between the two different bowls, keep the batter you aren’t working on covered, as the macaron batter will dry fast. Work quickly because you don’t want the batters to start setting and drying, even being covered. Once you finish folding the first batter, place it in the piping bag, and seal the piping bag by twisting the top, so the batter doesn’t get dry. It will help to place the piping bags in a cup, so this way, the piping bag will be held upright. It will be better if you work in rows, instead of piping the whole tray at once. Pipe a row of the darker color batter, then immediately pipe the lighter color in the center of that row. Place sesame seeds on top of the first row, and tap the tray to release air bubbles. Then move on to the next row. The macarons will start to dry pretty quickly, specially if you are in a dry climate. And that’s why you have to work in rows, because otherwise, the sesame seeds won’t stick to a dry shell. 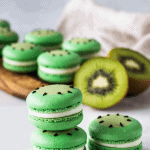 Use a toothpick to pop any air bubbles you see in the shells of your kiwi macarons. 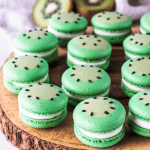 What did you think about my Kiwi Macarons? Do you enjoy kiwis? They were pretty much my favorite fruit as a kid! I am so happy I got to turn them into macarons!! I loved how they turned out! Not to mention that I absolutely loved the kiwi jam! I had never tried kiwi jam before. But I am a huge fan now! This recipe will probably leave you with a bit of kiwi jam leftover. But I don’t think you will have a problem using it up. Just eat it with a spoon, or spread it over a biscuit. The leftover kiwi jam will keep for quite a bit in the refrigerator, if well covered. Probably up to 10 days. Mine didn’t last that long. If you like making macarons, please enjoy some more of my Macaron Recipes, as I have a tone on my website. If you are new to making macarons, you can find tones of tips about how to make macarons on my blog posts. Also, I am always open to answering questions, just contact me on my instagram dm @piesandtacos, send me an email camila@piesandtacos.com, or leave a comment below. 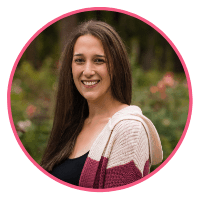 I will be more than happy to assist you in your macaron journey, to help you achieve your most desired macaron dreams! I hope you liked today’s recipe. Have a great day, thank you for reading!! I appreciate each and everyone of you who make my dreams come true, by allowing me to share this passion of mine with the world! 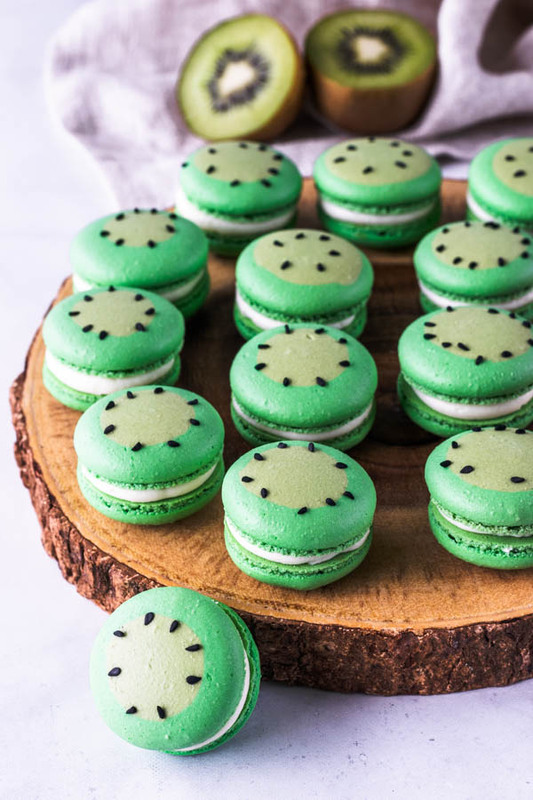 Kiwi macarons, filled with kiwi jam. The top shells are piped in two different colors to recreate the kiwi look. I used black sesame seeds to represent the kiwi seeds. Once you don’t see the dry ingredients any more, separate the batter into two different bowls. I grabbed about 3/4 of the batter for the darker green color, and 1/4 for the lighter green that would be the middle of the kiwi. Dye each batter at a time. Add the green food coloring to the larger batter amount, fold to the perfect consistency (see steps below to identify the perfect consistency). Place batter in a piping bag, twist the top of the bag so the batter won’t dry while you color and fold the other batter. Dye the second batter with less green food coloring, so you can have a lighter green. 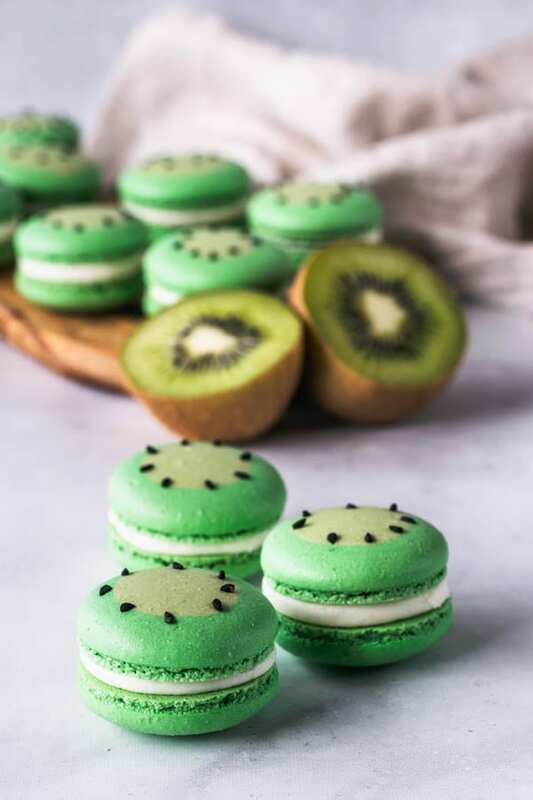 Fold to the perfect consistency (see steps below to identify the perfect consistency), place it in a piping bag fitted with a small round tip, since you will need to pipe smaller amounts of the light green batter to make the center of your kiwi shells. Set aside. Pipe circles of the dark green batter on your templates. 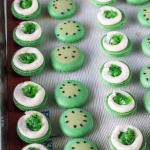 Use the light green batter to pipe a small dollop in the center of each macaron. If putting sesame seeds on top of the macaron shells, do so right after piping the macarons, as the shells will start to dry out as soon as you pipe them, and the sesame seeds might not stick to the shells if the batter has dried. I used tweezers to help place the seeds in the center of the macaron in a nice circumference. 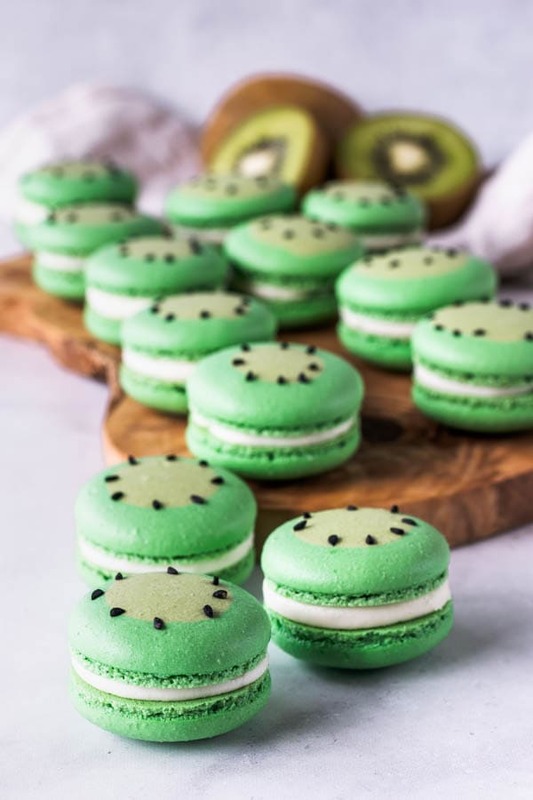 You want to do this in half of the shells, and leave the other shells plain, since they will be the bottom shells of the kiwi macarons, and they don’t need to have the seeds and lighter green in the middle unless you want them to. Bang the trays against the counter a few times each. This will release air bubbles that are in the batter and prevent your macaron shells from cracking. Mix kiwi and maple syrup (or sweetener) in a small pot. Bring to a boil over medium heat, cook, stirring, for about 5 minutes. Use the spoon to break up the kiwi as you stir. Once kiwi has boiled and reduced a bit, add cornstarch and water to the pan. On low speed, beat the sugar and butter together. Once they are incorporated, turn speed to medium and cream for 1-2 minutes until very fluffy. Add vanilla extract and beat for a another 30-45 seconds. Pipe a circle of buttercream around the edges of the macaron, in a way that you have a little hole in the middle. Fill the little hole with a bit of kiwi jam. Don’t overfill it. Place another shell on top. 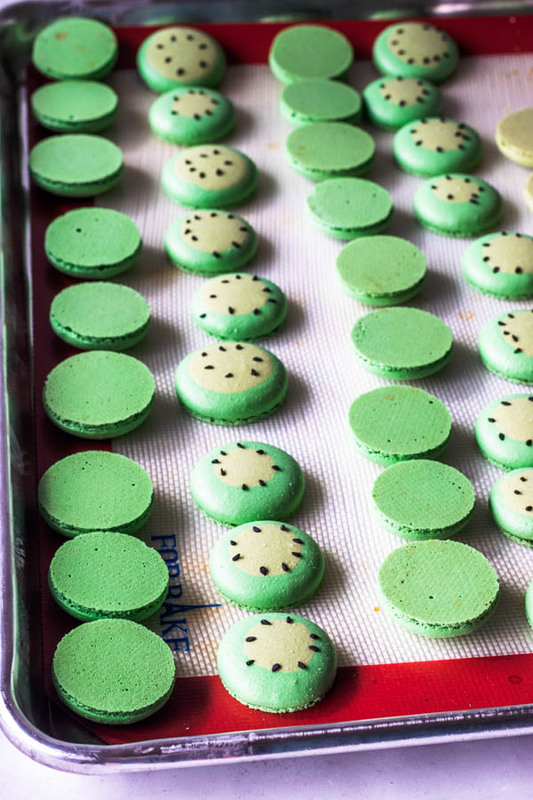 These Kiwi Macarons will be at their best up to 4-7 days in the fridge. Assim é covardia, nem deu tempo pra eu fazer a última receita e você apresenta outra maravilha dessas!!!!!!! Que macarons sensacionais!!!!!! These macarons are so gorgeous and such a great video tutorial. It’s really helpful to see the different stages.. I really want to try kiwi jam now too.